There are many documents establishing Julius Vahlteich and Carl (Karl) Julius Vahltich but never together. Is it the Superman/Clark Kent logic? If they are never seen together, they must be the same person? 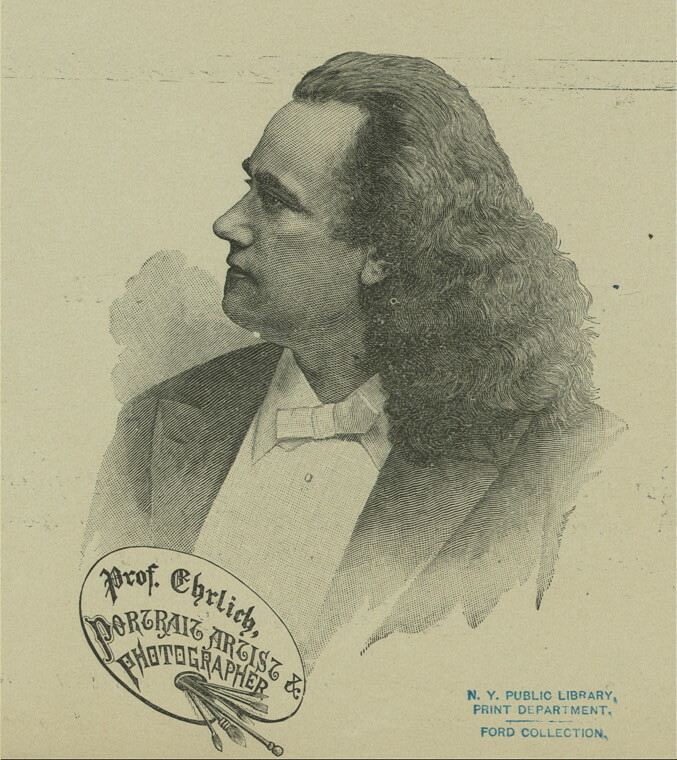 Carl Julius, after a career in controversial German politics, emmigrates, not wholly by choice, to the US, 26 Jun 1881 and so does Lina Vahlteich apparently at the same time on the same boat. Both name the “Greek” as the passenger ship on which they arrived in New York. 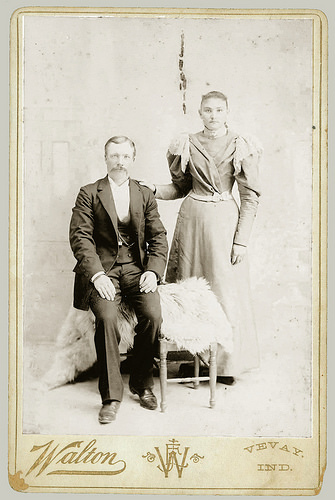 A passenger manifest from the ship shows Mr. Julius Vahlteich and Mrs ditto ditto (no name)…ages 41 and 20. 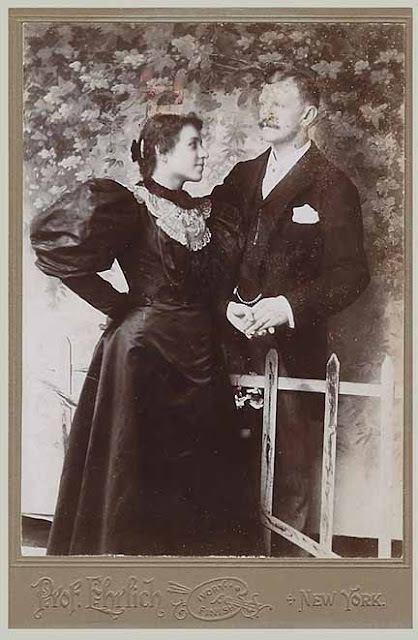 Birth dates from other sources confirm these ages right for Carl Julius and Lina in June of 1881. The Vahlteich “husband/wife” team of photographers however, exists in only one document out of more than fifty found mentioning them. In the 1887 Chicago Lakeside city directory they are shown at the same address, 292 North Avenue, Chicago, as photographer/artist. The two following years, Julius is listed as photographer but no mention is made of Lina. All other mentions of Lina Vahlteich have her living alone or with a couple boarders. documents. But she spells it "Lina" when she signs papers. Her marital status varies from document to document. In the 1900 US census she is living alone but “married” and in 1910 she is still living alone but then she is “Single”. In the 1920 US census she is now a “widow” although the census date was 22 Jan 1920, and Carl Julius Vahlteich didn’t die until 15 Feb 1920. This would make one suspect again that Carl Julius and Julius might have been two separate people. But considering all the other inconsistencies in their records, this is probably just another one. Census details show Lina as “no occupation” from 1920 to her death in 1937. In the period from about 1890 to 1920, Lina and Julius don’t seem to be living together; in fact Julius does not even appear anywhere in every census and city directory that Lina does. Documents on Carl Julius Vahlteich and Julius Vahlteich are numerous but there is little to show that the two names are the same person. Only in the case of his two passport applications, ten years apart, do the two meet. The first in 1903 is signed Carl Julius Vahlteich and the second in 1913 is signed Julius Vahlteich. Otherwise the two signatures appear identical. Also the facts stated on the two applications are identical. It is clear that Julius did little if anything in the photography business after 1889 as he was quite active in politics and in 1906 became editor of New Yorker Volkszeitung the longest-running German language daily labor newspaper in the United States of America, established in 1878. His activism was probably why he does not consistently appear in city directories and the census. He apparently moved around a lot. 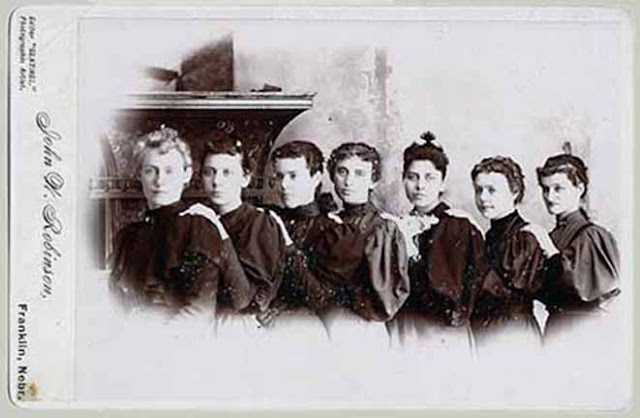 In 1891 there was a disruption in the Turnerbund, a German social organization in the US. Carl Julius was a member of a Chicago chapter of the Turners. The local chapter did not like his outspoken anarchistic political views and wanted to oust him. It was against the National Turners bylaws however. The Chicago chapter then disassociated with the National group so they could vote Carl Julius out. This was after all, basically why he was banished from Germany in 1881. 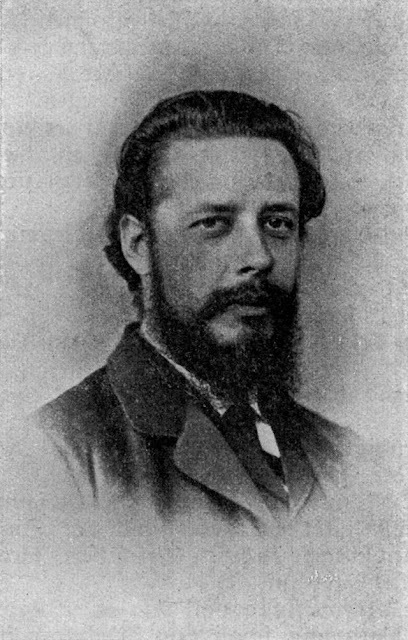 For instance, in 1873 to 1875, he worked as a paid agitator of the SDAP (Social Democratic Worker’s Party). The growing political climate in Germany didn’t want to deal with an anarchist. 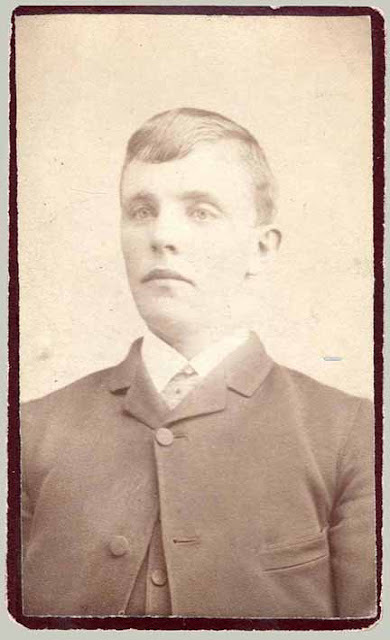 John R Vahlteich, according to the US census of 1910, appears to be the son of Karl Julius Vahlteich but not the son of Lina Vahlteich. 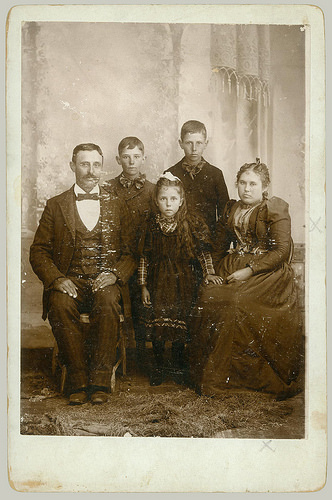 Records show that John was born about 1865 when Lina would have been only three years old. 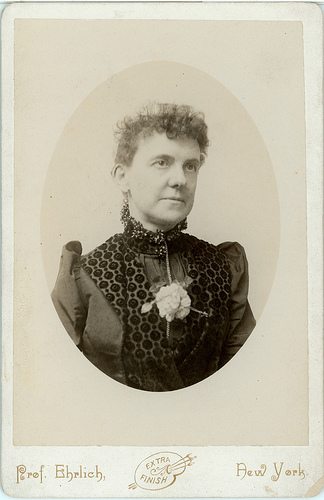 The cabinet card example at the top includes the monogram imprint that seems to be "J V". Quite possibly it was finished by Carl Julius Vahlteich himself but more likely actually done by Lina Vahlteich between the years 1890 and 1900. The card at the right has no monogram imprint and was probably done by Lina Vahlteich in that same period. 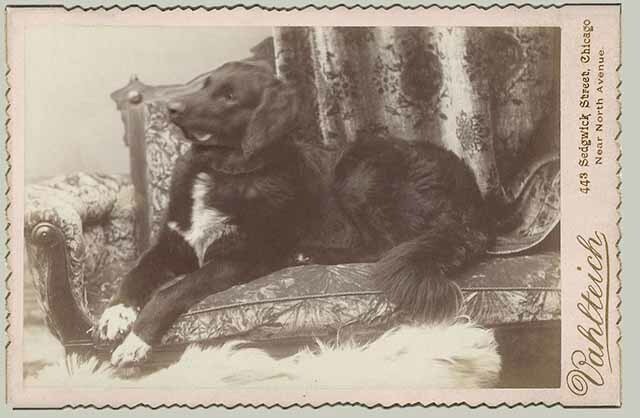 Like the card at the top, the card at the right has no monogram imprint so was probably done by Lina Vahlteich between the years 1890 and 1900. Vahlteich was at 443 Sedgwick, Chicago, definitely from Oct of 1890 to Jun of 1905, possibly a few months before or a couple years after. The card on the left was probably finished during that period. The card on the right shows the address of 292 East North Av. 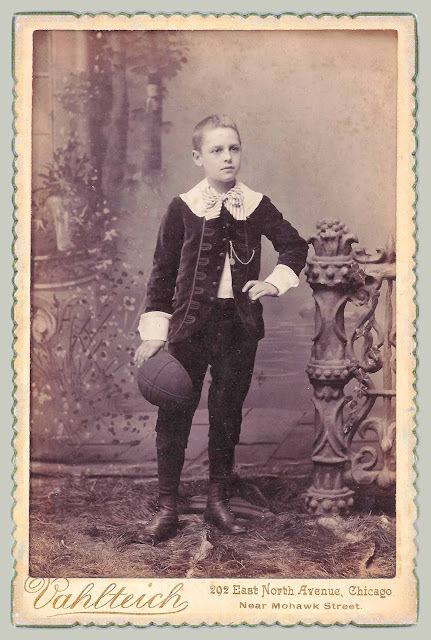 The card is reported to have been made in 1892. 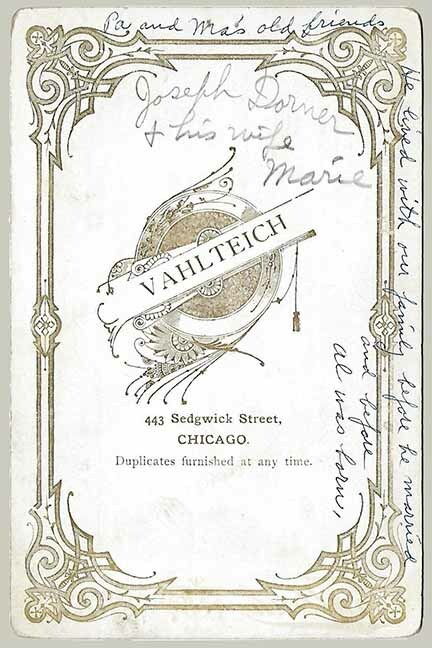 A voter registration list shows that Vahlteich had already moved to 443 Sedgwick by Oct 1890. 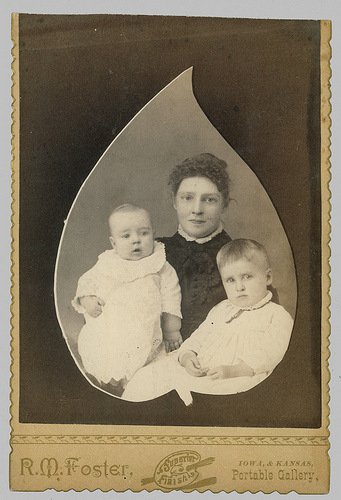 The address difference is quite possible as old pre-printed card stock was often used up sometimes years after a photographer had changed locations. 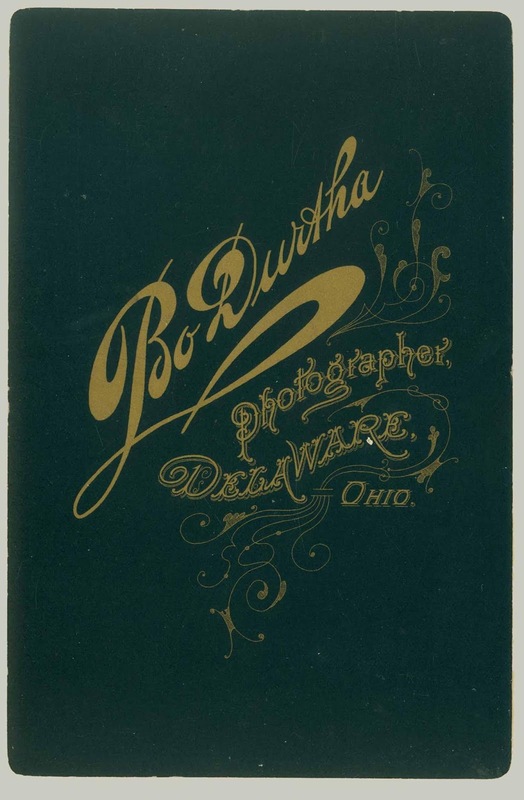 Charles H Bodurtha had a studio in Delaware, OH, starting in about 1880 and carried on by his daughter Natalie Bodurtha until 1954. The card at the top of this page does not show a studio address so it could have been done at any time within those dates. The monogram at the bottom, center, says “C H B” so it was most probably done before his death in 1915 but studios have been known to use up preprinted stock even years later. 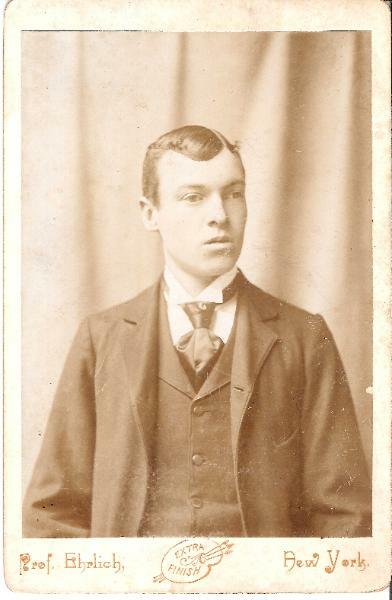 The style of the card indicates 1900 or after. If a card is fortunate enough to have a studio address printed on it, closer dating should be possible. 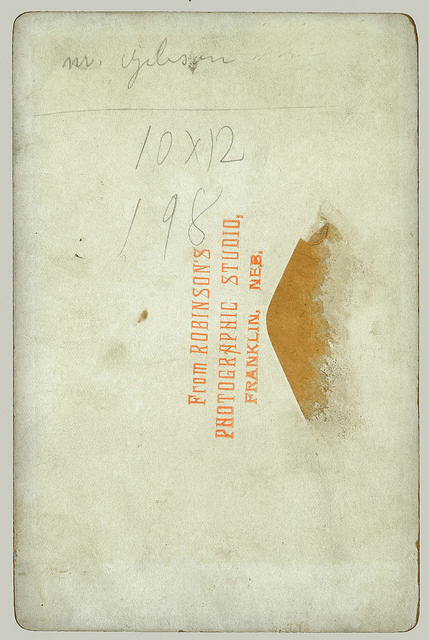 An example of a card from Baker's Studio while it was operated by ALfred C Thurston and H Thurston. Note the photographers names are added with a rubber stamp. It appears the J. E. Walton spent his entire life in Vevay, Indiana. 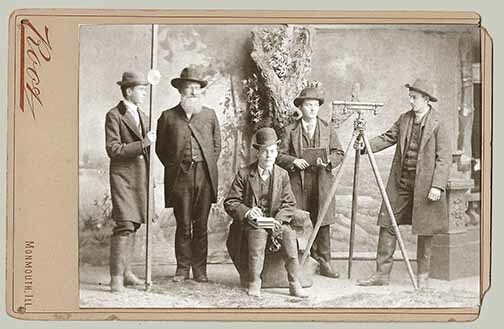 The earliest record of his photography is the 1880 US census when he was 32 but he probably started in his 20’s. He is then documented to be a photographer on his death certificate in 1916 at age 69. 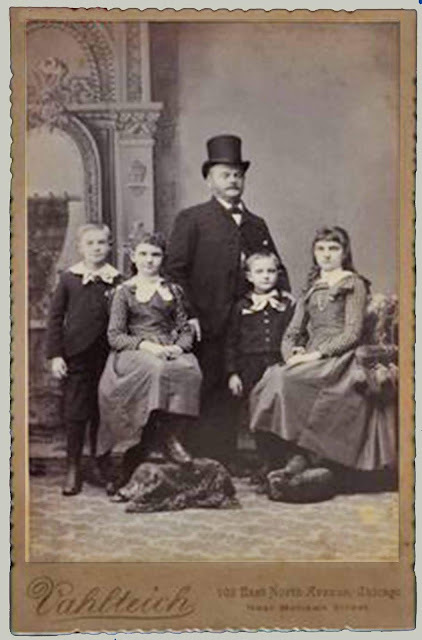 Since there is no address on this cabinet card, the time frame cannot be narrowed through his biography. The physical characteristics of the card do indicate a range of 1889-1896. 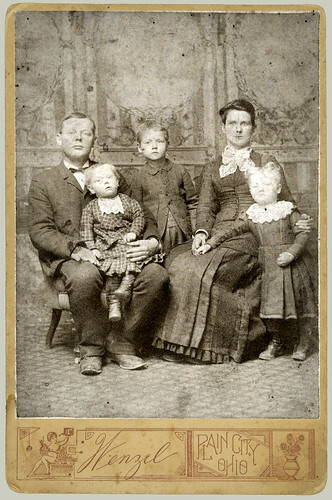 These two ladies are identified as Mary Annetta ("Kate") Holliday and Sarah Elizabeth ("Lida") Holliday born 1849 and 1851. 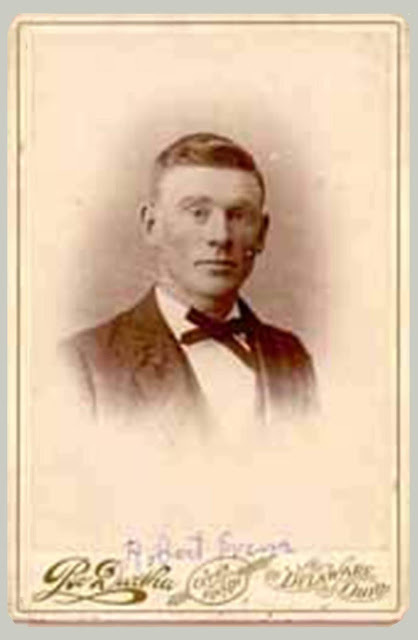 J C Hughes was found as a farmer for most of his life in Carbondale and Murphysboro, IL. All documents listed him as a farmer except one. In July 1863 a civil war draft list shows Jeremiah C Hughes as a farmer. Just two months later, in September 1863, a tax assessment list shows J C Hughes of Carbondale, IL, as a photographer. 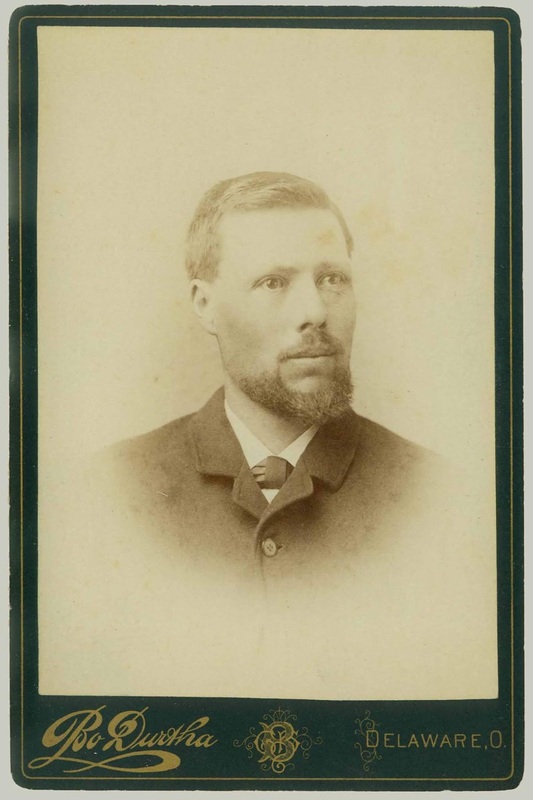 The next record found is the 11 June 1870 US census which shows him as a farmer again. 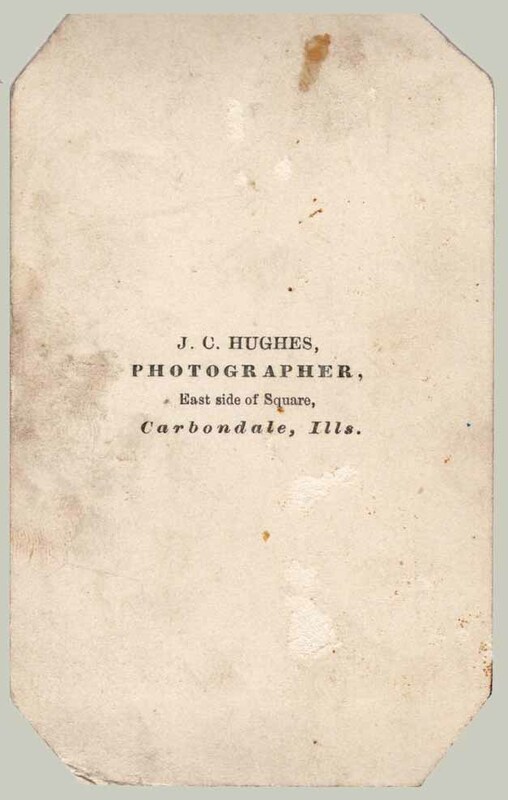 So there is a space of about 7 years from Sept 1863 to Jun 1870 that J C Hughes COULD have been a photographer. 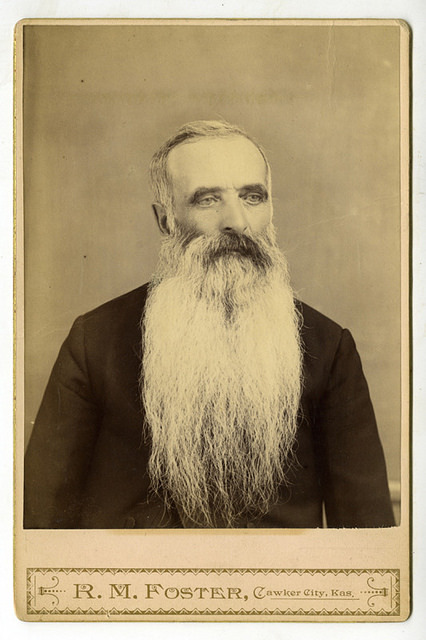 He was a photographer in 1863 but it is not known for sure when he quit and went back to farming. 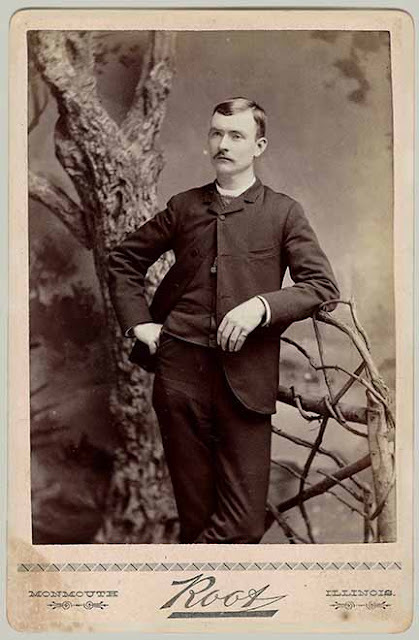 Jeremiah’s brother Benjamin F Hughes was the artist/photographer, at least in most documents found about him. He died at the young age of 58. 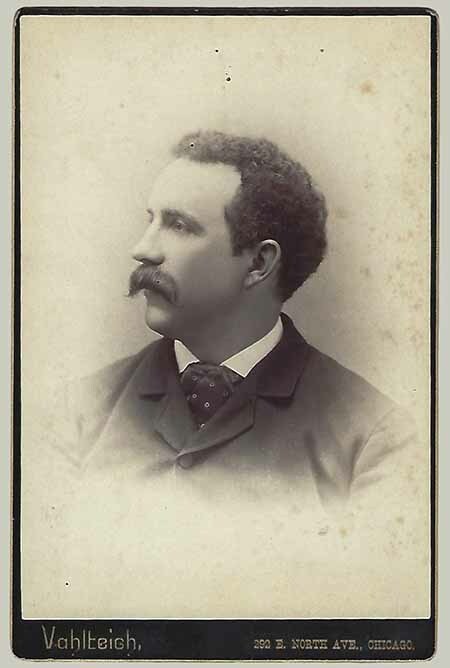 Note he is NOT the same as Benjamin E Hughes who was partners with Charles M Bowman in Omaha, NE, in 1890. All in all, it looks like neither of the Hughes brothers were very serious about being portrait artists. There were no mentions of them found in Photography Journals or the newspapers of the time. One should consider a photograph by either of the Hughes brothers to be quite rare. 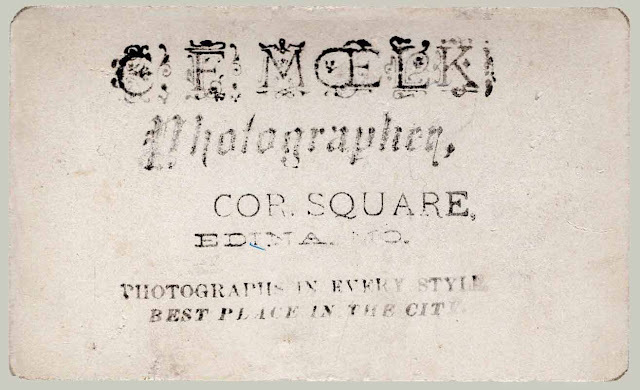 Charles F Moelk worked as a photographer all of his life starting at age 15. Most of that time, he worked as an employee at studios operated by someone else. And he moved several times: Ohio, Indiana, Missouri and Texas. 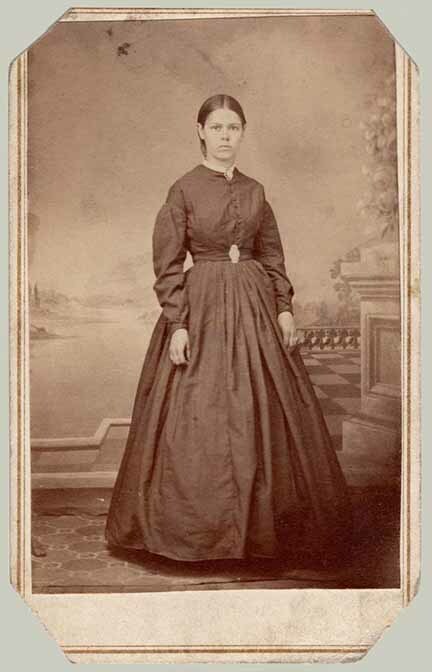 The CDV here must have been finished about 1886 during that short time Moelk was living in Edina, Missouri. Note also that the imprint on the card appears to be by rubber stamp. This could indicate a very temporary situation. All data from US Census or city directories. The death date is not known but W. J. Root seems to have still had a studio when he was 76 in 1930. 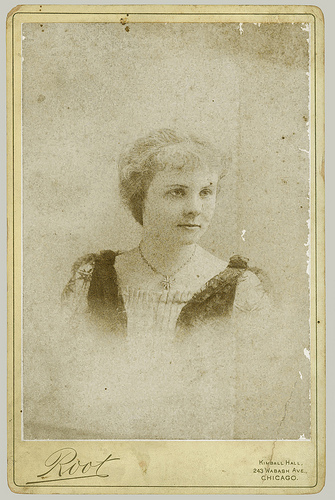 The cabinet card here was probably finished between 1902 and 1918. 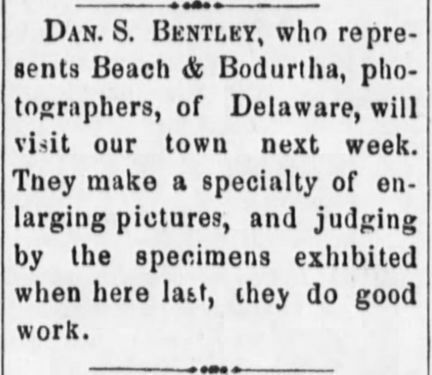 This photographer Root of Monmouth, IL, is not the same as William J Root of Chicago, IL. No family or business connection between the two has been found to date. E A Root seems to have never ventured from Monmouth, IL after moving there with his family when he was about five. Nearly every document found relating to Emerson A Root, gives him a different birth date. 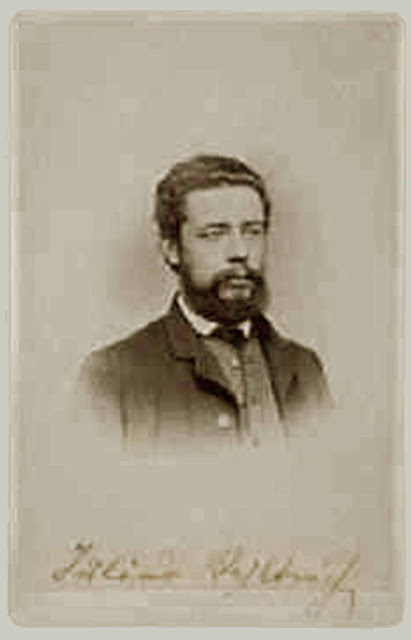 His father Henry E Root was listed in the 1870 US census as a photographer and in the 1860 US census as an Ambrotypist. 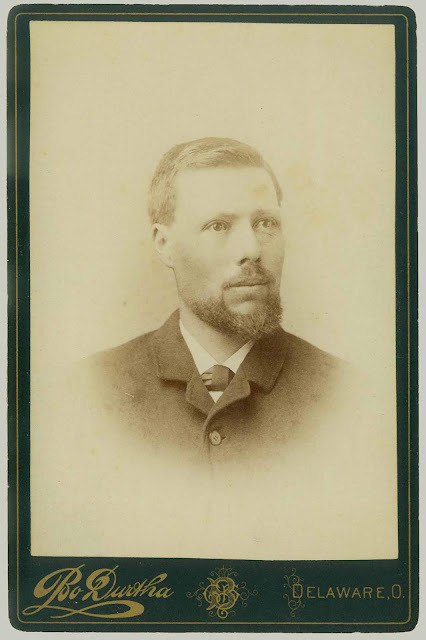 His father and both of his brothers, Melville and William H Root were photographers in one document or another, but Emerson Root seems to have been the only Root with a studio in Monmouth, IL, during the era of the cabinet card. In the Monmouth, IL, city directories of 1903 and 1905, the photography studio was apparently also a bowling alley. Emerson Root is documented as photographer from 1880 thru 1905. This photograph was probably done in the later part of that period. Apparently in 1903 and 1905, the photography studio was also a bowling alley. Note that Emerson’s brother Melville Root is also listed as photographer. He has no separate studio listing in the business pages so he was apparently working for another photographer at the time. This one would be by E A Root who was the one who had a studio in Monmouth. 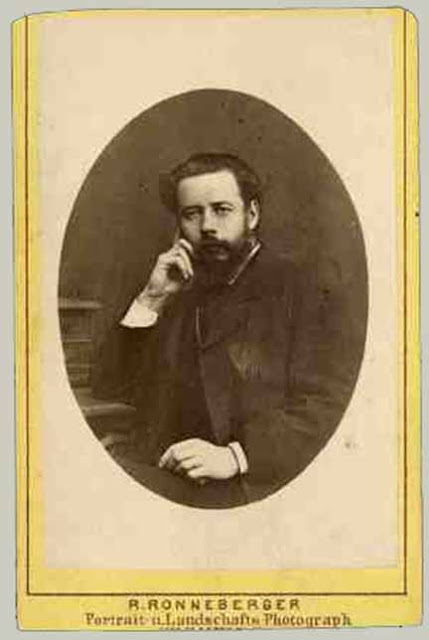 Apparently both of his brothers William Henry and Melville E worked at the studio at one time or another. This one is by William H Root. 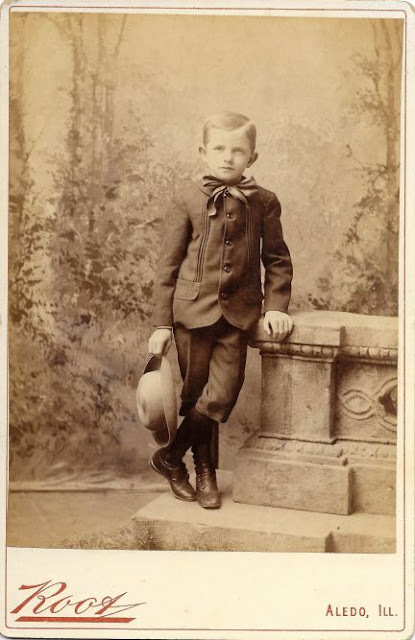 He was in Aledo, IL, for the US census of 1900. Records are a little sketchy before that. 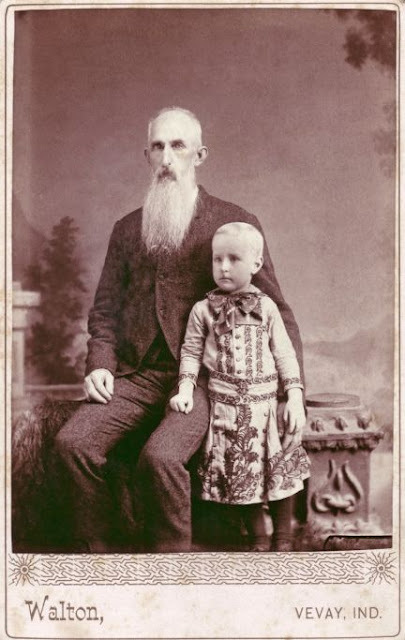 He was still in Monmouth, IL, for the 1880 US census. All documents list him as a photographer beginning with the 1900 US Census.] but he was probably already established by 1880. 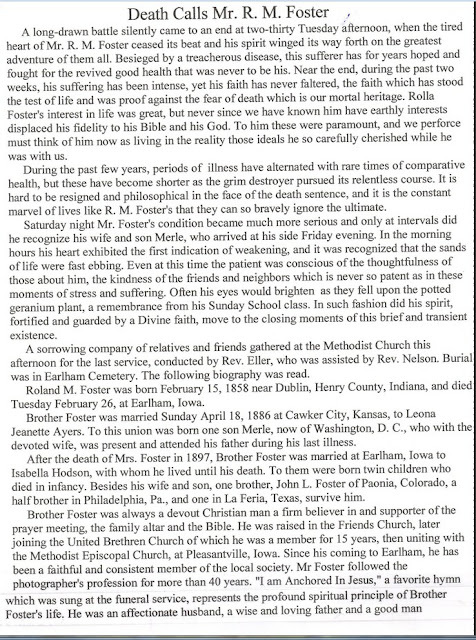 Documents show R. M. Foster was in Kansas from 1886 to 1897 then to Iowa for a couple years. The US Census for 1900 says he was back in Kansas. 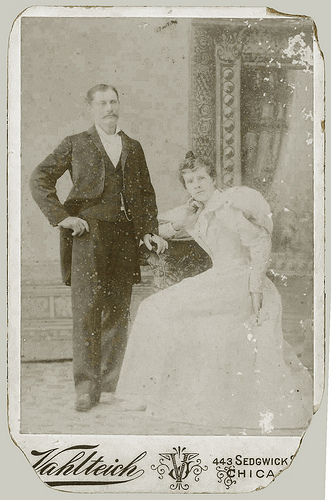 The cabinet card at the left was probably finished between 1886 and 1897. Mr. Foster really got around. He had studios in Pleasantville and Harvey, Iowa as well as in Missouri before coming to Cawker City. 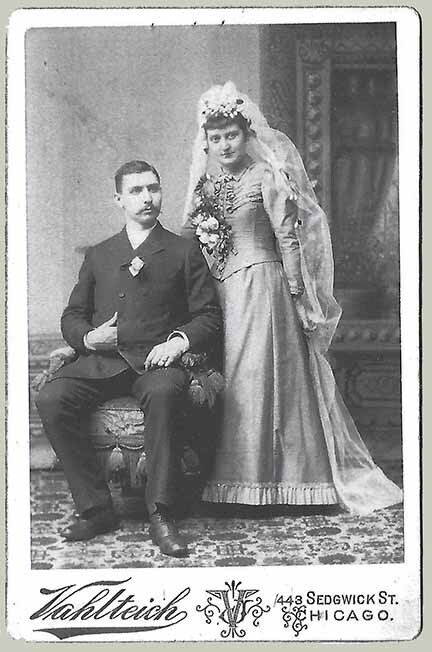 He married Miss Ayres in Cawker before they moved to Enterprise where she died. 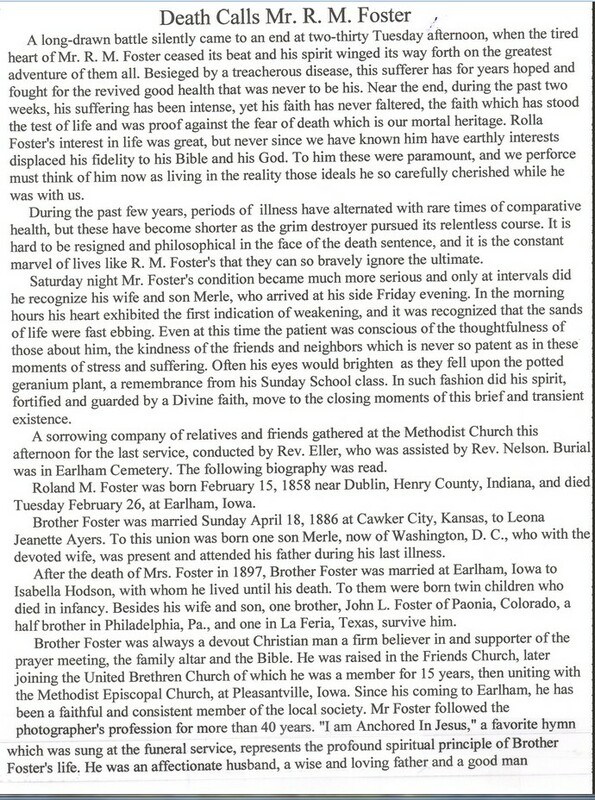 R. M. Foster was not his real name. He was trying to hide his Jewish heritage. Later, he moved to Lincoln, Nebraska where he took the name of the street he lived on!. 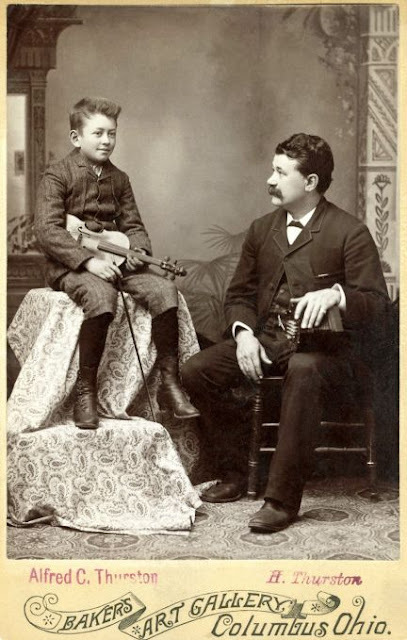 The name Ehrlich occurs quite often in records from New York and the east coast of the US in the late 1800’s. 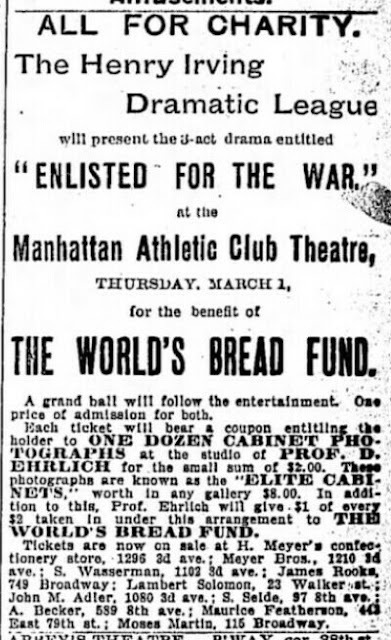 Support has been found in newspaper and magazine articles and ads to confirm that “Prof.” Ehrlich had a photograph studio at 160 E. 66th street in New York City, from 1892 to 1902. Only one article was found in the New York World, 01 March 1894 which shows him as Prof. D. Ehrlich at that address. 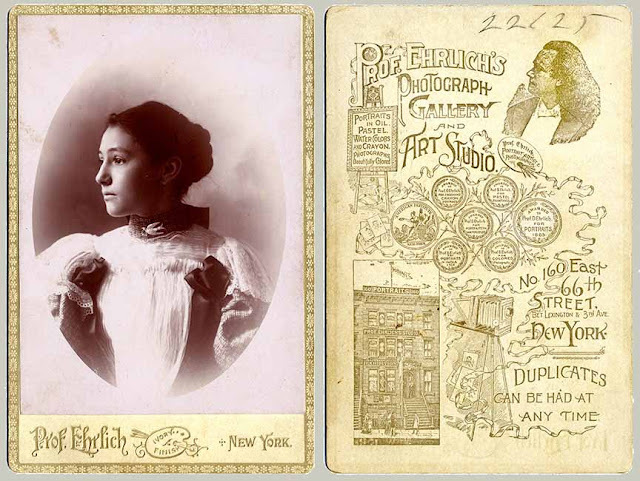 In the 1902 New York City, NY, city directory, there appears in the business section, a David Ehrlich, photographer, at 157 E. 75th and in the residential section Davie Ehrlich is an “artist” at 160 E 66th street. No biographical information has been confirmed as yet. 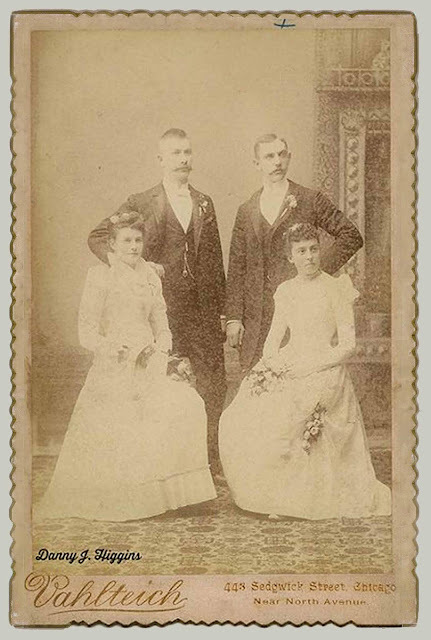 The cabinet card at the left was probably done between 1882 and 1902. Unfortunately the source on this example has been misplaced. If you can identify it please let me know. So far there were four states that had a Robinson Photographic Studio, New York, Florida, Kansas, Maryland, and one in Ireland. No connection has been made yet to a studio in Franklin, NE. 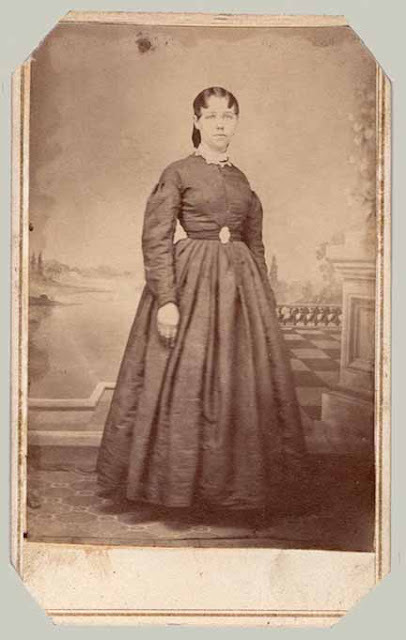 There were a number of photographers named Robinson in the cabinet card era, mostly on the east coast of the US. 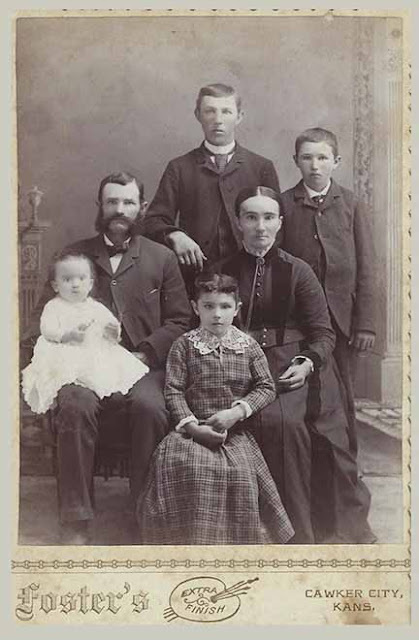 Nothing has been found so far to connect any of them to the Robinson Photographic Studio in Franklin, NE, or anyplace in central US. The identification on this card is by a hand stamp on the reverse not an imprint on the front. This might indicate that the studio was quite temporary. Robinson might have been an itinerant photographer who didn’t have a permanent studio. But this is all speculation.